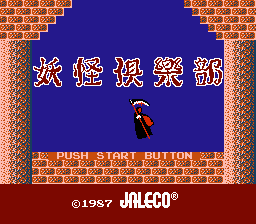 Youkai Club is an action/platformer game developed by TOSE and published by Jaleco in May of 1987. 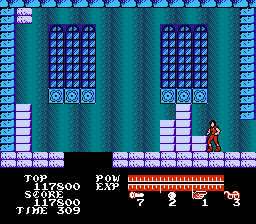 This was just around the time that Akumajou Dracula (AKA Castlevania) was enjoying quite a bit of popularity. 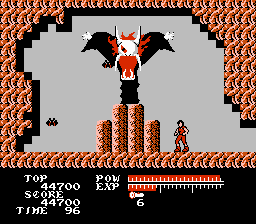 So you could say this game was a cash-in on Castlevania‘s success, but it’s not a straight up clone. 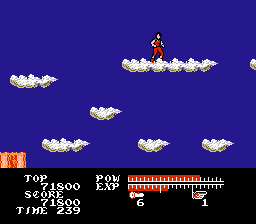 The most noteworthy difference is that the game has a basic experience system, in which the player’s power is increased as you gain experience. The plot takes place in the year 199X, as an evil force known as Gallus has awoken from his slumber. 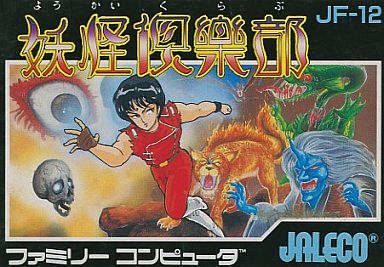 It’s up to Akira, a young Esper, to fight against the yokai (a class of Japanese demon) that threatens the human world. It’s a little like the plot to the cult classic Universal movie The Monster Squad, except with Japanese demons (and an occasional clown, weirdly enough) instead of monster movie icons. 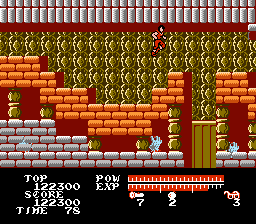 The game kinda looks and feels like Castlevania, at least at the outset. However, there are some fairly substantial differences. The character movement isn’t as rigid, allowing you to control jumps. 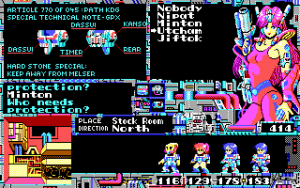 Many areas are vertically scrolling, and in fact not entirely linear, allowing you to explore in different directions to find items. 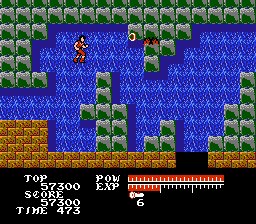 In place of the whip are projectile-based attacks that begin with limited range. 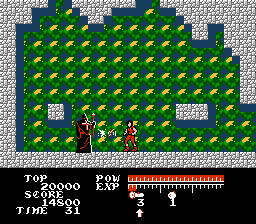 Killing enemies does not increase your experience, and instead you have collect items that will give you points. Once you reach certain thresholds, your attack will be upgraded. 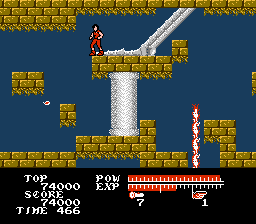 Essentially you go from throwing daggers (“Psycho Stinger”) with limited range to shooting fireballs (“Psycho Flare”) across the screen. 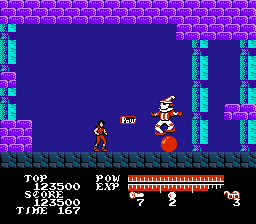 There are also various power-ups. 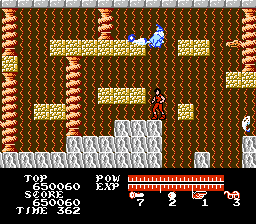 There’s the POW, which completely restores your health; a power-up that freezes enemies on-screen; a bomb that kills all enemies on-screen; an invincibility item; and a power-up that grants a doppelganger effect, creating shadows that effectively triple your firepower. The collectible power-ups can be triggered by pressing Up + B. 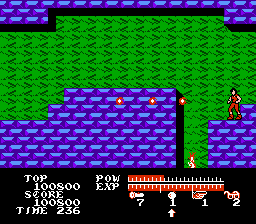 Like any game of this era, Youkai Club is kind of difficult. At least there are no one hit kills, but it’s still easy to die. 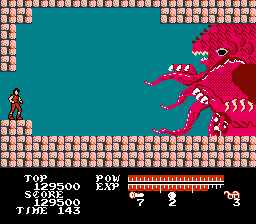 What makes it difficult is that most of the enemies fly around the screen, making it hard for you to attack, but also leaving you open for damage. 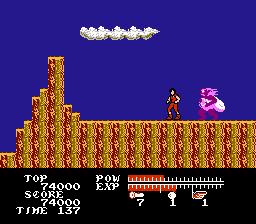 If you’re not careful, they can really chip away at your health, and that big lifebar suddenly isn’t so big. 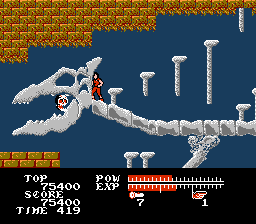 The game also has too many sections devoted to pits and platforming. 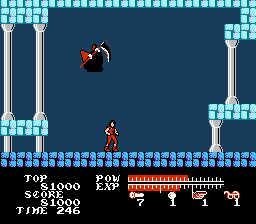 One wrong jump and you’re dead, or an enemy hits you and you’re knocked into a pit. You only have a single life, and if you end up dying, you get sent back to the beginning of the stage minus some experience. 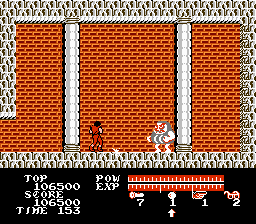 However, in the game’s defense, with the experience system, the game does get easier the farther you progress. Your attacks become stronger and better, plus it’s possible to get health upgrades. 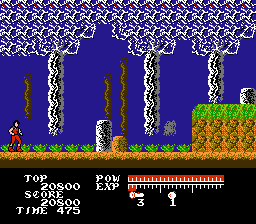 Also the power-ups are very useful, and the ones that have short-term effects last a somewhat lengthy amount of time. The only catch is, just don’t die, because it can screw you up in the long term. There are only six stages. 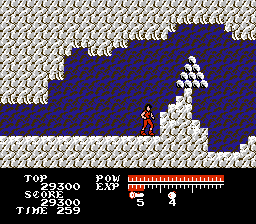 There’s a map screen in between levels, but it’s just a simplistic picture of a mountain with a small marker indicating Akira’s location. There are also points in the game where the level design is somewhat confusing and it becomes difficult to figure out what to do next, so a walkthrough is recommended. Graphically, the game is alternatively bland and ugly. The later levels are better looking, but there’s no real consistency amongst anything. 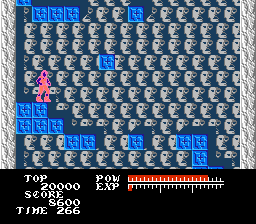 The first level (“Kaoyashiki” or “Face Mansion”) is a realm with masks tiled all over the background, which looks really, really strange. Occasionally you’ll pop into caves with bizarre color schemes. 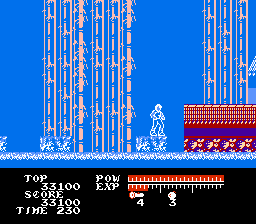 Later areas feature bamboo forests, but then in another stage you’re fighting through what seems to be a haunted house, complete with mummies and witches, enemies which would seem more appropriate to Castlevania. Similarly, the music isn’t bad, but it just doesn’t stand out. Youkai Club is hardly a classic. The experience system is interesting, but doesn’t make up for the basic and uninspired nature of the game. 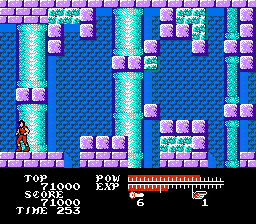 Still, fans of Castlevania might want to give it a go, because it’s better than other clones at the time, like 8 Eyes or Matou no Houkai.